Let's hear it for bacon. We all know it's not the healthiest thing, but do you really know anyone who says, "I really don't like bacon."? Feeding My Ohana cooks with butter, real sugar and yes bacon, but all in moderation. With a little beach and yoga and running thrown in. The original recipe also included a nutmeg/tangerine/spinach saute. I was never able to get this to work. But far be it from me to waste perfectly lovely bacon, so once you crisp up the bacon, use it for some fresh spinach salad. Or take a bit of the bacon grease into another pan, toss in some garlic, then fresh spinach and squeeze a lemon in to finish it. Use a non-stick pan. Cook bacon until crispy and then take out and drain it on paper towels. Very light salt and pepper the salmon. If there is a lot of bacon fat, drain a bit off. 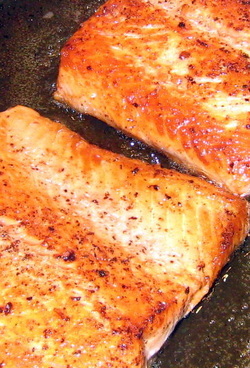 Cook the salmon skin side up in the bacon drippings for about 6 minutes. flip it so that the skin side is now on the pan and cook for another 6 minutes. It will look like the picture when you are done and taste fantastic.